Verdict: Xcent is better value-for-money and reliable than the Zest, but Zest has superior fundamentals. Reliability & After Sales Service: In the last 15 years Hyundai has worked really hard and has established a stellar reputation for itself, while Tata has remained adamant and unresponsive towards it customers, who have rightly rewarded and punished the two brands respectively. Over an ownership period of 5 to 7 years, the Xcent is bound to depreciate around 50,000 Rs. less than the Zest. Fuel Efficiency: ARAI rated mileage of the Xcent diesel is 24.4 kmpl which is 1.4 kmpl more than the Zest. The Xcent maintained that lead in our back-toback efficiency tests as well. The petrol burning Xcent has an ARAI rated mileage of 19.2 kmpl which is 1.6 kmpl more than the Zest. Even the petrol Xcent maintained its lead over the Zest in our real world tests. This makes the Xcent around 30,000 Rs. cheaper to run than the Zest over a 5 year period. 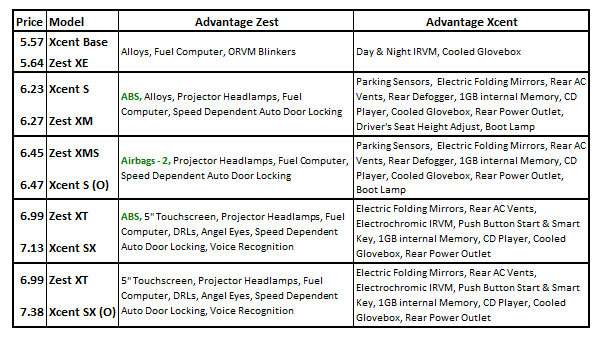 Dynamics: In terms of engineering fundamentals, Zest certainly has an edge over the Xcent. It has a more pliant ride and higher ground clearance than Xcent, which makes it more suitable for Indian roads. Drivability & Performance: Both cars feel distinctly underpowered, Zest struggling with turbo-lag & Xcent struggling with overtaking manoeuvres. Space and Comfort is exemplary in both the cars. Both are good products & are extremely well priced, but if you consider that Hyundai has thrown in one country's best after sales service experience for free, then there remains no doubt that the Xcent deserves to be crowned the winner of this comparo. Price Difference: Before we compare similarly priced variants of the Zest and Xcent, lets not forget that an Xcent will be around 80,000 Rs. cheaper than the Zest over a 5 year period of ownership, thanks to better resale value and higher fuel efficiency.